Did I have you at “free bacon for life?” If you’re like my son, I’m guessing that’s what grabbed your attention! Sure, you want to save time at the grocery store, but I’m betting you want that free bacon even more! 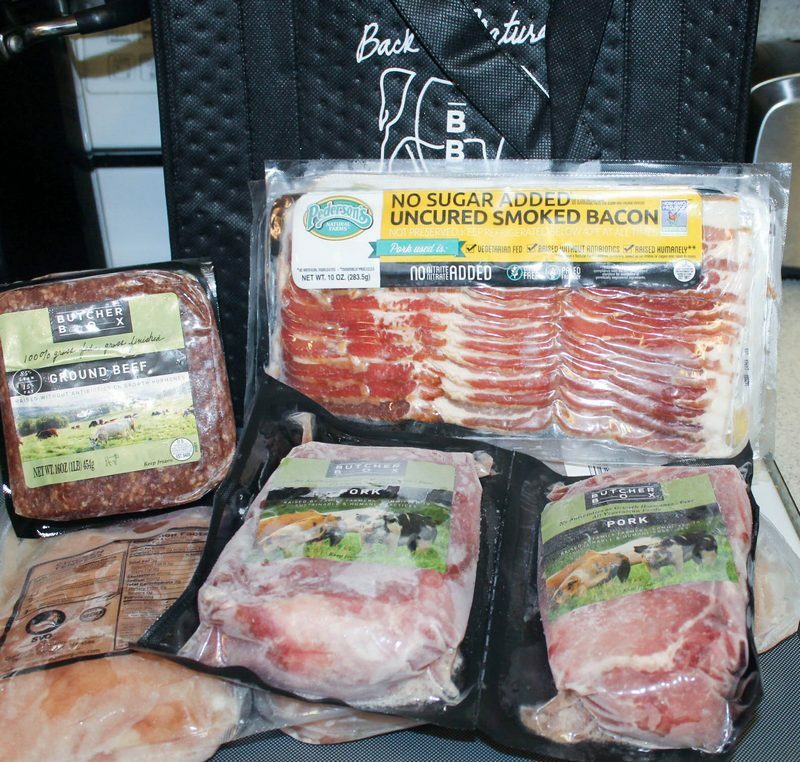 Read on to learn how ButcherBox works, why it saves you time and, of course, how to get that bacon! What’s the Big Deal about ButcherBox? *Heads up: I received a complimentary sample box in exchange for telling you about ButcherBox. I only share things that I actually use and/or that I think you will really like, and all opinions are always my own. Before we get into the details about what you’ll get with ButcherBox, how to pick your box, and how to get that free bacon, let me tell you a quick story. Don’t worry, I won’t be offended if you just scroll down past it. So, I was a vegetarian for like 24 years. I stopped eating all meat when I was 14. When I got pregnant with my son at 29, I started eating chicken and turkey again. That’s all I currently eat. When my brother did a brief stint as a vegetarian when we were still teenagers, my mom gave up beef. She didn’t really see the point in making it since neither of us ate it. She, however, still ate (and eats) pork. My son takes after his father when it comes to his meat-eating preferences. He likes all of it. He LOVES bacon and burgers (and especially loves bacon on burgers), and he always orders a steak when we go out to eat. I don’t have issues with him eating all these different types of meat. He’s such a picky eater that I’m just happy when he likes anything beyond peanut butter and fluff! Here’s the problem, though: I have NO idea how to buy the types of meat that I don’t eat. My mom sent me to the store to get pork ribs because Jake wanted to try them. I bought some weird things that said ribs, but didn’t have the bones and didn’t quite taste right. When it comes to things like steak and beef, I’m even more clueless. I couldn’t tell you the difference between top sirloin and ground round if my life depended on it. I don’t even know if those are from the same type of meat. 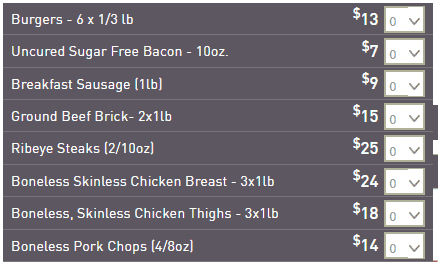 For me, ButcherBox saves me time by taking the guesswork out of it. I don’t have to stand in front of the meat section and hope that someone comes by so I can ask them what I’m supposed to get. I also don’t have to worry about getting some substandard type of meat that ends up going to the dogs because no one else likes it. That’s why one of the reasons I like the idea of ButcherBox so much. Now, let me tell you a few reasons why you’ll love it! Want to skip the meat section of the grocery store entirely? You really can’t get much more convenient than fresh meat delivered straight to your door, now can you? I don’t think this particular feature needs more explanation! Here’s one that matters to all of us: from chicken to beef to bacon, every meat that you receive from ButcherBox is of the utmost quality. They only work with companies and farmers who care more about producing the best possible meat, rather than padding their bottom line by cutting corners. Meat is sourced from USDA-inspected locations that also have someone on hand at all times to further ensure quality. For me, this is the most important factor of all. All of the meat from ButcherBox comes from animals that were humanely raised. The cows spent their days grazing in fields eating grass instead of standing in stocks eating hormone-laden “feed.” Chickens are provided with hay bales to climb on and other special touches to give them a stress-free life. 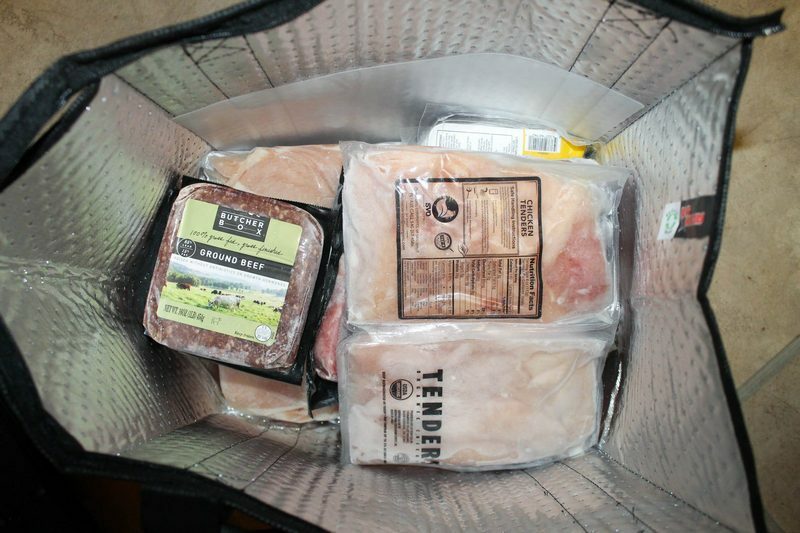 Beef & Pork Box- 8-11 pounds, may include things like steak, ground beef, pork chops, and so on. All Beef Box- 8-10 pounds work of beef, including steaks. Custom Box- my favorite option, you get 9-14 pounds and pick the cuts you want. It is a bit more than the other boxes ($149 vs $129 for the Classic Box), but you have total control AND you get a little extra. Example of items you can include in your custom box. 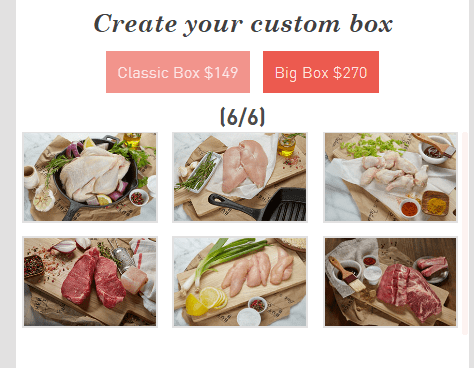 Each box comes in two sizes: classic (described above) or Big Box (which comes with 16-22 pounds of meat for most boxes, or 18-26 pounds for the custom box). Along with the meat, you can choose from 12 add-ons. I received a mixed box and was really quite surprised by how much I got! My box including chicken breast, chicken tenders, pork ribs, another kind of pork, two packages of bacon, and two packages of beef (1lb each). We still have quite a bit in the freezer. My mom and Jake ate one package of bacon right away, though. I also used about half of the chicken to make herb & garlic chicken, one of our favorite easy pressure cooker meals. The chicken was fantastic! ButcherBox lets you make meals for around $5.40, give or take. Keep in mind that every single meat in the box is free-range, grass-fed, and hormone-free. It’s like buying meat from a real old-fashioned butcher shop without actually leaving your house. Example of some of the add-ons, subject to change depending on the box and product availability. The add-ons are also a great value! For example, you can get six 1/3-pound burgers for $13. You would spend about that much on one burger at a restaurant. And now, the moment you’ve all been waiting for (cue drumroll). The FREE BACON FOR LIFE deal is currently live and runs throughout November. Just visit ButcherBox and look at the top of the page for the big banner that says “Claim Offer.” Really, you can’t miss it. Then, just select your box and start your plan! 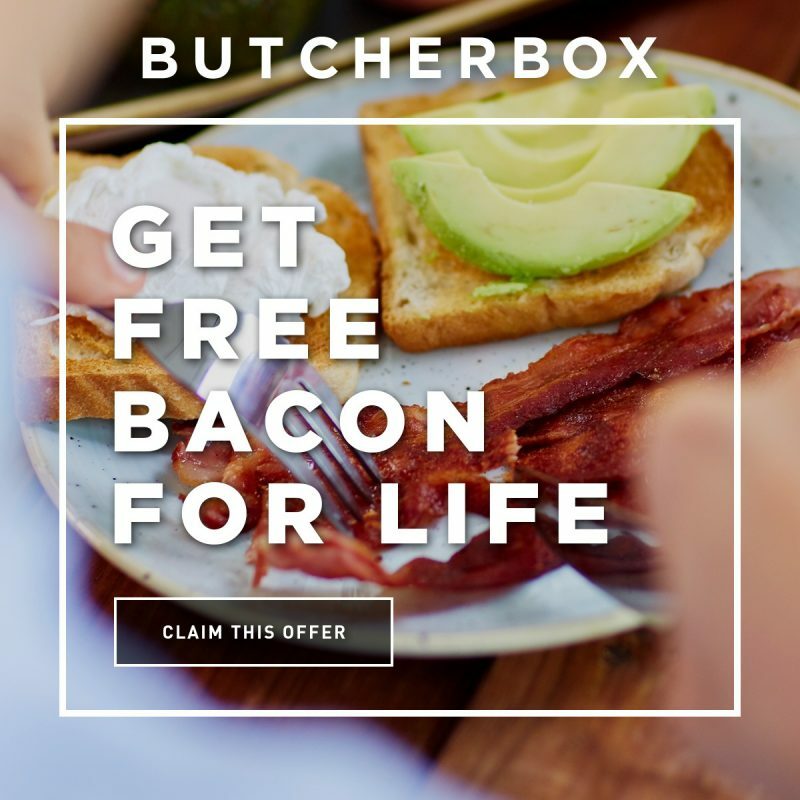 You’ll get a free pack of bacon in every ButcherBox you receive for the life of your subscription. Check out this video for a visual guide to claiming the offer. UPDATE: Now that the proverbial cat is out of the bag, I can share the details! Start your ButcherBox subscription today through Cyber Monday and get 6 FREE steaks with your first box! So, I can’t really tell you the details about the Black Friday deal because it’s under embargo and I promised I’d keep quiet, but I am allowed to tell you that you do not want to miss it, especially if you love steak. I am also allowed to tell you that it runs from Black Friday through Cyber Monday, but that you’ll want to get in on the action early because it is almost guaranteed to run out quickly. Bookmark ButcherBox now so you can take advantage of the Black Friday offer as soon it is goes live! This is really cool, and the first time I’ve ever heard of ButcherBox. It can be intimidating to me to see an cut of meat I’ve not made before and feel confident to buy it and make it, this is perfect for someone like me!